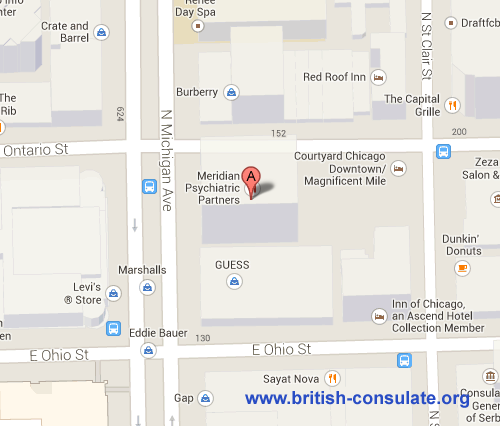 Note that the The British Consulate General in Chicago represents the UK government in 13 states across the upper Midwest of the United States. If you do not live in one of these areas then see the British Embassy in Washington for a full list of the consulates in the United States. If you live in this area then you can contact the consulate for advice on registering a birth or a death or notary services. You need to contact the British Embassy in Washington to ask about passport renewal or applying for a new British passport. You can also ask about a British visa such as a visitors visa, spouse visa, fiancee visa or an education visa for the United Kingdom. By appointment only. See Access and opening times to make an appointment for notarial services.